It’s hard to believe that it’s already time for my “exit” show at Medalta… seems like it was just last month that I was setting up my studio. Time flies when you’re elbow deep in clay. If you’d like to see what I’ve been up to the last few months in the studio, my show Stories I Tell will be up in Medalta’s Yuill Family Gallery from June 19 – July 26, 2014. Stories I Tell is a body of work that I created during my tenure as a long-term artist in residence at Medalta’s International Artist in Residence Program in Medicine Hat, Alberta. As a dedicated functional potter, I view functional work as a powerful lens through which to engage with others on an intimate level and explore ideas of home, personal space, and identity. In making my work I strive to create beautiful, useful objects that will bring joy to people’s daily lives, and go on to forge connections and stories of their own. Ultimately, my goal is that my pots will introduce a little beauty into the world, ideally creating a space where the user can pause to savour a moment of calm in the midst of a busy day. 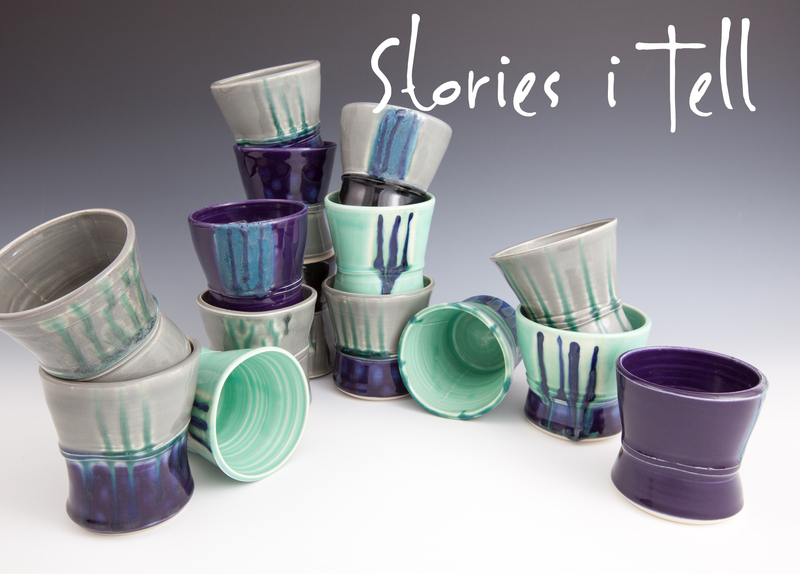 As such, a key part of the show is a collection of 40 cups that will be given away, free of charge to members of the public throughout the exhibit, with the goal of demonstrating how the use of handmade objects can enrich ones daily life. In exchange for the cup, the recipient will be asked to send a postcard to the artist with a short story or reflection on using the cup and encouraged to tag tweets and photos to #storiesitell. Thank you to the Ontario Arts Council for their generous support of this project. This entry was posted in New Work, News and tagged functional ceramics, Medalta, naomi clement, Stories I Tell, Yuill Family Gallery by naomiclementpotter. Bookmark the permalink. That’s a great idea, Naomi! Hope it works out. And the cups themselves are scrumptious! Thanks Carter! I’m excited to see how it goes – check back soon for updates.